The selection from today’s Gospel is one of my favorites. The story gives us a look into how family is defined by Jesus, while additionally helping us to understand how we should order our lives. Jesus isn’t rebuking or disowning His relatives. After all, don’t we know that they, too, were doing the will of God? But what Jesus says is that it isn’t the blood relation, it isn’t the hard work of parenting, or the years of a shared household that makes a sisterhood or brotherhood in the eyes of God. It is the hearts united in Him that form new bonds as a family in Christ. It is hands united as we work side by side to complete the will of God. At Blessed is She, we refer to you all as our sisters. It isn’t a term that we use flippantly or as slang for a female friend. We are united through the bonds of Christ, through His pain, His suffering, His Cross, and His redemption. Just as biological brothers share a mother and father, we too share individual and intimate relationships with God the Father and Our Blessed Mother, to whom we are given as adopted daughters. We share an intimacy with Jesus our Christ, our Beloved, as we are each on our own journey to better know Him, love Him, and serve Him. Our bonds of sisterhood aren’t just in this life, but continue into the next. 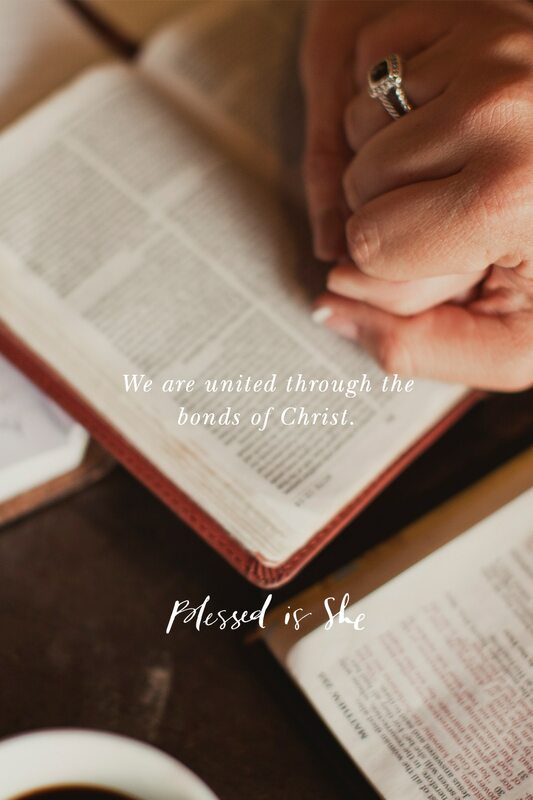 Whatever the circumstances are surrounding your family of origin, know that you have a sisterhood—a family here too, as we are connected in and through our love and service of Christ. Pray today with me for all our brothers and sisters in Christ around the world, that they may have peace and strength to complete the will of God, and that they may know that they are not alone. We are united through the bonds of Christ, through His pain, His suffering, His Cross, and His redemption. Offer a prayer to the Holy Family today, the Blessed Virgin Mary, Saint Joseph, and Our Lord, in thanksgiving for your relationship with them. What a beautiful way to start my day. Ironically, I had been thinking to myself just this morning that I wasn’t sure I belonged in this group. I’m older than most and have no children. This reflection made me rethink all of that and realize how blessed I am to have this sisterhood in Christ. Thank you for your message today. Both my sons are also adults now, but I love this group. I love the fresh perspective and the deep reflections. It’s a beautiful way to start my day. I’m turning 70 this year and my children are grown. This post touched me dearly. I am in my mid 40s and with no children of my own along with my parents gone, I rely upon my hubby. I have a brother out of state, but knowing there is a sisterhood of ladies as close as family is a beautiful reminder of how Gods love and arms reach us in our times of need. I needed this reminder today, that we are all connected in our faith and we all belong to one another.